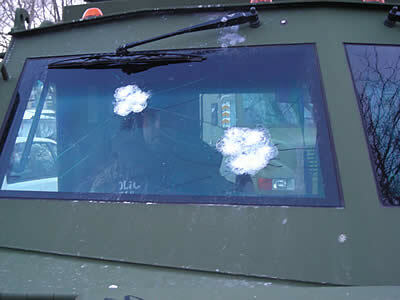 Park Forest, IL–(ENEWSPF)– The South Suburban Emergency Response Team’s [SSERT] armored vehicle shows damage to the passenger-side window of the vehicle after Robert Lyons, 67, fired at police after an eight-hour armed standoff at his home, according to reports. Negotiations failed, police say, and police shot Lyons after he fired at them, according to reports. The evidence is above. "There was an officer in the passenger seat," one officer who was at the scene told eNews Park Forest. "He tried to kill him." Lyons was shot after he fired at police, police said. The Lenco BearCat® armored vehicle has a gun turret on top and several gun ports around the vehicle. The stiff $250,000 price tag was paid for entirely by one donor as a gift to the twenty-two communities that make up SSERT. The donor prefers to remain anonymous. SSERT is a special weapons and tactics team trained to undertake assignments typically involving very dangerous and volatile situations. These units are typically referred to as S.W.A.T. teams. Other member communities of SSERT include: Blue Island, Burnham, Calumet City, Calumet Park, Chicago Heights, Country Club Hills, Dixmoor, Dolton, Flossmoor, Glenwood, Hazel Crest, Homewood, Lynwood, Matteson, Midlothian, Oak Forest, Park Forest, Posen, Richton Park, Riverdale, Sauk Village, South Holland, Thornton, and Tinley Park. According to on Park Forest Police Officer, the cost to replace that one windshield is "…a lot."